For pregnant woman and post-natal mothers. After birth, the mother’s hormones are usually erratic. Vata, which governs the nervous system and movement (movement of body fluids, neurotransmitters, blood and lymph circulation, elimination of wastes) in the body is mostly always and heavily out of balance. Mum needs deep rejuvenation & strength to provide the baby with much required, immunity, strength, pure and nutritious breast milk and of course, love. I have formulated this Post Natal Ayurvedic Support Kit to regulate the female hormones and provide the mother with much needed strength and energy. Further, these remedies are highly successful when mum has low milk supply and provides diverse nutrients to the infant through the mother’s milk to pave the path for strength and immunity. This kit is extremely important after a scheduled c-section to ensure mum has the readiness to feed. I highly recommend that these remedies are used as close to birth as possible for maximum effectiveness. However, it’s still beneficial for mum to take the herbs up to when the baby is 6 months old. Read the full Ayurvedic Post Natal protocol here. 500ml Shishu Kumkumadi Baby Massage Oil. (Postage within Australia only or Pick up from Bondi Beach Clinic). Massaging your baby with oil is one of the most important rituals to build and strengthen the bodily tissues and the immune system. Studies show light-touch massage (as used in Ayurvedic massage technique) releases more oxytocin than deep-pressure massage in both the person getting the massage and the person giving the massage, enhancing this “loving, bonding hormone” between you and your baby. This medicinal oil utilises a base of high quality extra virgin organic olive oil that is grown locally on small farm by friends of Vital Veda. 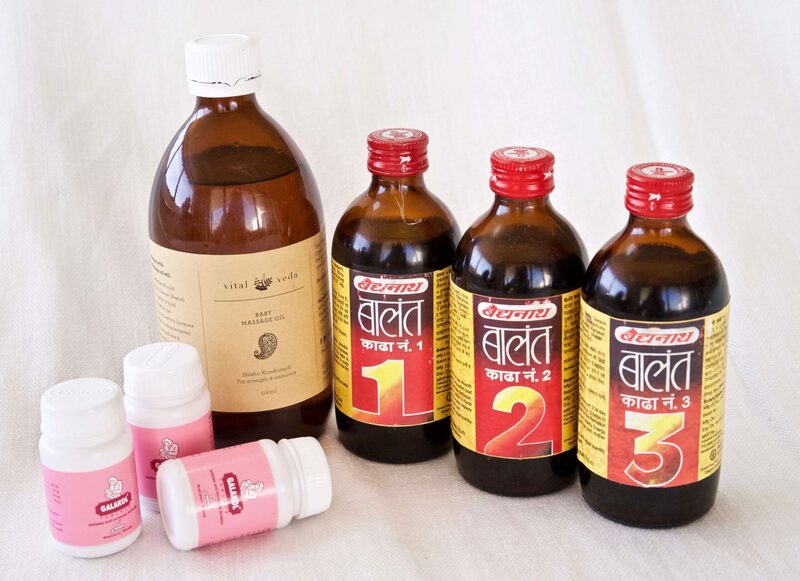 The oil is medicated with Ayurvedic herbs prepared by the Raju Family, and personally processed by Dylan Smith of Vital Veda with much love and intention to nourish the baby’s nervous system and strengthen the body at the same time. Helps to relieve weakness and increases lactation after delivery. Helps to relieve constipation, weakness, body ache, backache etc. Provides diverse nutrients to the infant through the mother milk. Tones up the blood circulation and helps for the formation of new blood cells. Helps maintain vitality, energy and strength of the body. Tonic for both mother and infant. Increases Lactation and Purifies Breast Milk. This herbal nutritive tonic can be taken by the mother even if breast milk is slightly not 100%, thus good to have on you incase. These herbs have no known drug interaction. All the above ingredients are regularly tested for pesticides and heavy metals and are purified according to our high standards. To restock on specific herbs contact Vital Veda. Gallakol Tablets – 2 tablets 2-4x a day before meals/empty stomach as needed. Balant Kadha 1 – Take 3 tsps w equal amounts of water 2-3x a a day before meals for 10 days. Start as soon after giving birth as possible, (you can start the day of or after giving birth). After these 10 days start BK2. Balant Kadha 2- Take 3 tsps w equal amounts of water 2-3x a a day before meals for the next 10 days. After this start BK3. Balant Kadha 3 – Take 3 tsps w equal amounts of water 2-3x a a day before meals for the next 10 days. Shishu Kumkumadi Baby Massage Oil – Lubricate baby generously with the oil and give massage.